Sidney Slon/Pipe Dream Photographer Junior Anthony Sparacio won both of his dual matches this past weekend, extending his winning streak to four in the 141-pound weight class. 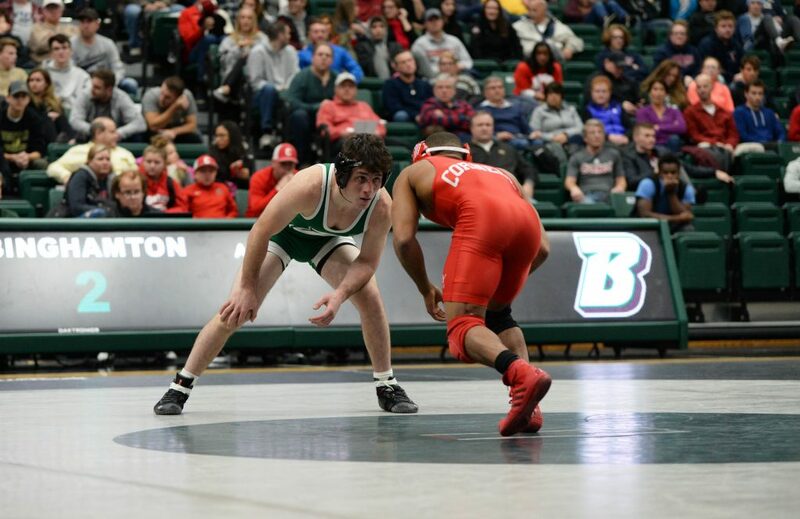 Following a disappointing start to the season, dropping three straight matches by a combined score of 95-23, it all came together for the Binghamton wrestling team this weekend. After being hampered by injuries early on, the Bearcats proved to be a different team when healthy, capturing two straight dual meets. Binghamton (2-3, 2-1 EIWA) defeated Penn 24-12 and Columbia 23-12. In the match against Penn (1-5, 0-3 EIWA), four BU wrestlers picked up their first dual victories of the season, including redshirt freshman Zack Trampe, who recorded his first career win. Redshirt freshman Aidan Monteverdi also secured his first dual win of the season in a thrilling overtime victory in a 165-pound match. Binghamton’s young wrestlers continue to prove their value to the team, and Borshoff recognized the importance of establishing a winning attitude for the program as a whole. Following their first victory of the season over Penn, the Bearcats traveled to Columbia (4-3, 0-3 EIWA), where they took down the Lions by a score of 23-12. Monteverdi registered his second straight victory with a revenge victory, and redshirt freshman Lou DePrez recorded his fourth straight outing at 184 pounds. DePrez boasts a 19-4 record on the season and currently sits at No. 8 in the country. Borshoff emphasized the significance of building a winning culture and how the veterans in the locker room are just as vital as the coaching staff. Since the slow start to the season, BU has caught fire, and several wrestlers are riding streaks heading into their next match. In addition to DePrez and Monteverdi, redshirt freshman Joe Doyle has won two straight matches while junior Anthony Sparacio has picked up four consecutive victories. Although the next three matches will be on the road for Binghamton, the Bearcats will look to keep up the momentum. Regardless of where the team needs to travel, Borshoff is confident in his team’s abilities. The Bearcats will travel to Cambridge, Massachusetts on Jan. 26 to face off against Harvard University. The dual at the Malkin Athletic Center is expected to begin at 1 p.m.